You know what they say about real estate: location, location, location. When you choose to live in Oberlin, Ohio – whether it is in the home you have loved for years or a comfy cottage at Kendal at Oberlin – you have chosen wisely. From arts and culture to dining and shopping, Oberlin is a very walkable community that has it all, including plenty of intergenerational opportunities. In fact, Oberlin was named one of the five “Best Intergenerational Communities” in the country in 2012 by Generations United. Plus, Oberlin is only a short drive to Cleveland and many attractions in the surrounding areas. Let’s discover a few of the restaurants, shops, and one-of-a-kind experiences you can only find in Oberlin! Oberlin offers a lot of great dining destinations. Here are some favorite local spots to try while you’re in the area. This restaurant/bar/escape from everyday life has a loyal fan base that will make you feel at home, no matter what mood you happen to be in. Whether you want a hot coffee or a cold brew, this is the place. And if there was one thing not to be missed, it would be the amazing weekend brunch. The menu changes every weekend depending on what fresh, local ingredients are available. This Oberlin tradition is beloved by young and old alike. For more than 20 years, Lorenzo’s has served the community Italian dishes made with love and know-how. The food here is based on one simple philosophy: “The customers know quality, and if you give them the best product, you will receive their loyalty.” The sauce and dough are made from scratch, and toppings come from the freshest vegetables, meats and cheeses. This Oberlin staple is not to be missed! Located in the lobby of the Hotel at Oberlin, 1833 Restaurant offers seasonally inspired menus, showcasing locally sourced ingredients and regional artisan products. A cool atmosphere, unique beverage selections, and a friendly staff make 1833 Restaurant a fun gathering spot. Serving breakfast, lunch, dinner, and weekend brunch, 1833 is open year-round and welcomes both hotel and public guests to enjoy dining overlooking historic Tappan Square. Looking for the best places to shop in Oberlin, Ohio? The city boasts a variety of excellent local shops that are perfect for an afternoon outing. From gifts to games to art supplies, you’re sure to find everything you need. Enter into a world where there is a little bit of everything—from your everyday wants and needs to rare toys, games and other exciting merchandise. Like a kid in a candy shop, you won’t know where to start, and you definitely won’t want to stop! Because Ben Franklin is locally owned, you can find discounts on everything from books of every kind to green products. Supporting local suppliers, as well as the environment, makes Ben Franklin a guilt-free shopping spree. The Tuck Shop in Oberlin was started in 2013 by two sisters-in-law. The term “The Tuck” is from England and means a small, food selling retailer. Tucks are often found in college towns and they often sell items of stationary and gifts. You’ll find gourmet popcorn, homemade cashew/peanut brittle, salt water taffy, chocolates, unique gifts, signs and much more. The Tuck Shop hopes to provide a variety of unique treats and “tucks” to the community of Oberlin. It is easy to get lost in a world of beads here, wondering where the hours have gone and how you ended up with loads of new beads. With a wide variety of handmade sterling, gold-filled, copper and brass beads, the diverse line of vintage, ancient and new beads is not only eccentric but awe-inspiring. For the crafty or crafty at heart, Bead Paradise II is worth the time. Now that you have experienced some of the best dining and shopping in Oberlin, Ohio, you are ready to move on to the cultural treasures and art scenes the city has to offer. From classical to contemporary and timeless to modern, you will not be disappointed. The Frank Lloyd Wright house is part of another Oberlin gem – the Allen Memorial Art Museum! The Weltzheimer/Johnson House, designed by the famous American architect, is also referred to as the Frank Lloyd Wright house. Wright developed the idea of organic architecture — “promoting harmony between human habitation and the natural world through design approaches integrated with its surroundings that they become one unified composition.” He developed what he called Usonia, which refers to his vision for urban living in the US. “Usonian Homes” are small, L-shaped structures made to fit around a garden terrace. Much of the design was meant to stay current with modern times. The Weltzheimer/Johnson House, which was completed in 1949, was the first Usonian house in Ohio and one of the few in the nation open to the public. A true staple in the Oberlin community, the Apollo Theatre has focused on cinematic delight for viewers of all ages for over 100 years. The single screen has shown everything from thrillers to dramas to family-friendly flicks for as many as 840 moviegoers at a time. In 2012, the theater was reopened following extensive renovations to transform the Apollo into a one-of-a-kind modern film and performance space on the first floor and the Danny DeVito and Rhea Perlman Cinema Studies Center for Media Education and Production on the second floor. According to Oberlin College’s Associate Professor Geoff Pingree, there is no other liberal arts institution that he knows of where students can study and make media, then take what they’ve learned and share it with the surrounding community. What’s more, it’s all from a home base that’s a grand, historic theater from the era of silent movies. The intimate Ginko Gallery & Studio features more than 250 artists, each with their own captivating character and talent. Not only will you find works of art on canvas, but you will find pottery, jewelry, glass, wood, metal, weavings and all sorts of other materials manipulated to form inspiring art. There are even whimsical figurines made from natural objects, like acorns, twigs, and seeds, painted in a “magical” way. Each work brings its own distinct personality to the space. What truly sets this gallery apart? There are five working studios where resident artists actually create the art you were just peering at on the other side of the wall. Seeing something beautiful actually coming to life gives the world of art a whole other eye-opening perspective. With more than 200 Steinway Grand Pianos within its walls, the Conservatory of Music is the largest collection of Steinway & Sons pianos outside the Steinway factory. The Conservatory is also the oldest continuously operating conservatory in the United States. 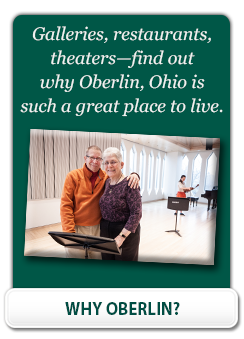 Residents of Kendal at Oberlin, as well as many community members, attend concerts and recital performances throughout each academic year. Conservatory students appreciate the opportunity to perform for a diverse and critical audience. These students are among the best young musicians in the world. More than 1,400 students apply from around the globe for a freshman class of only 120. Alumni often see their names in lights on Broadway, the Metropolitan Opera and The New York Times bestseller list. There are also award-winning composers, conductors and musicians. These are only a few of the cultural experiences awaiting you in Oberlin. Make sure to get out there and discover your own. Or you could change it up with a short drive to metropolitan Cleveland! Exciting Cleveland is just a short 45-minute drive from Oberlin. Instead of staying in with nothing special to do, discover the next town over. With world-renowned museums, first-class dining and Broadway theater, Cleveland has something for everyone. Beyond the Oberlin must-sees, try these hand-selected venues and dining highlights in historic and vibrant Cleveland. Cleveland attractions don’t stop with the famous Rock and Roll Hall of Fame or the FirstEnergy Stadium. If you’re looking for ways to enjoy the rich cultural tapestry of Cleveland, give these locations a try. Who would have known friendly Midwestern Cleveland is home to an internationally recognized art museum, featuring many of the world’s finest artists? Whether it’s European, African, Ancient Egyptian, Greek, Medieval, contemporary or photo galleries you’re interested in, there’s a never-ending feast for the eyes. Experience something different with the CMA’s mix of new exhibits, special events, performances, films, lectures, and tours. And when you need a break, check out the restaurant and café. With a 2013 museum expansion and all of University Circle’s cultural and artistic venues just outside the door, the CMA is a must for anyone seeking a new look at some of the classics. For the largest performing arts hub outside of New York City, head to Cleveland’s Playhouse Square, the cultural epicenter of Broadway shows, musicals and more. The top rate performers will wow you with all the magic of live performance. More than a million people a year come to Playhouse Square for its diverse range of shows including concerts, dances, plays, comedy, opera, ballet, speakers and more. Make sure you book your tickets in advance. With a variety of great eats and interesting venues in downtown Cleveland, there’s something to please even the most discerning and experienced tastes. Some say Cleveland is transforming into one of the latest modern fine dining cities, and Dante stands out as one of the best restaurants in town. When you’re looking for classic cuisine with a twist in the historic Tremont district, enjoy some of the unique plates from Chef Dante Boccuzzi. For something new to wet the palette, try the grilled seafood trio including prawns, scallops, and squid or Hawaiian tuna steak with braised daikon and bok choy. This former bank building boasts a traditional, comfortable atmosphere with a beautifully designed interior featuring local art. Relax with a five-course tasting menu or order a la carte. East Fourth is one of Cleveland’s latest revivals that combines vibrancy and sophistication near downtown Public Square. The area comes alive with the completely renovated, now walking-only street in an exciting destination area, perfect for a special evening of dining, entertainment, and exploration. Indulge in top-notch restaurants like Chef Michael Symon’s sophisticated signature Lola or environmentally conscious Greenhouse Tavern by Chef Jonathon Sawyer. If music and laughs are your thing, hit the House of Blues for the best beats in town or Hilarities comedy club, one of the largest theaters in the nation made for comedy. Before or after dinner, be sure to take a short stroll and visit the small shops or get a cup of coffee at Erie Island Coffee Company. If fresh produce and novelty treats tantalize your taste buds, then you can’t miss the premiere indoor market in historic Ohio City. Rain-or-shine, the market is home to some of the best and freshest food in Ohio. The market offers dairy, produce, meat, seafood, baked goods, organics, specialty items, and more from more than 100 family-owned businesses. You can even find ready-to-eat treats like candy and nuts. Since 1840, tourists and food show hosts have flocked to the West Side Market. If all the great choices are a little overwhelming, take the New Shopper Tour from an expert and find out where all your new soon-to-be favorites are. The tour is available the last Saturday of the month, lasts less than an hour and includes a Market shopping bag. Tucked in the corner of the main building is the Market Café,offering food crafted with ingredients straight from the West Side Market. When residing in Oberlin, the nearby cities and towns bring a variety of cultural excitements in Lorain and Cuyahoga counties. Perhaps when you think you’ve seen it all, just a short drive in any direction can take you to wineries, performing arts centers, restaurants, shopping, and more. Discover some of the top picks, all less than an hour from the heart of Oberlin! Lorain County’s hidden gem features quality performances, art, education and events in Elyria, as part of Lorain County Community College. For drama or culture, this tops the list as one of the top performing and visual arts venues in Ohio. After its 1980 founding, the first 25 years of the Stocker Arts Center welcomed more than a million visitors to its more than 1,000 performances, art galleries, films and cultural offerings. If live theater is your thing, check out the box office to see what’s in store for the upcoming season and reserve your seat in the 994-person main theater. Experience beautiful stories come to life and revive your passion for theater, or peruse the Beth K. Stocker Art Gallery, featuring art from professional artists, as well as community, faculty and student pieces. If you’re looking for a little creative inspiration or a renewed outlook, this is the place for you. For a relaxed atmosphere and friendly, rustic vibe, visit John Christ Winery in Avon Lake. The comfy indoors is perfect for playing one of the board games laid out for wine lovers. Or venture to the patio or backyard for a beautiful view of the vineyards. The 1946 winery makes and bottles the wine on site, offering award-winning varietal, French American, and vinifera choices. You can order by the glass or bottle. John Christ also welcomes outside food and snacks, which makes it a perfect choice for a friendly gathering. Relax while chatting away with new friends or shop for take-home bottles and novelty wine items in the on-site shop. The Beck Center for the Arts in Lakewood is one of Cuyahoga County’s top performing and visual arts centers. With a large-scale auditorium, it’s a great place for professional theater with a lower-key vibe. The Beck Center showcases a mix of musicals, dramas, family classics, youth theater, and other performances throughout the year. You’ll also find a variety of dance, theater, and art classes, as well as an art gallery. With two main stages, you can choose the smaller, studio theater for a more intimate show. The Beck Café is a perfect place for a quick coffee or snack, pre- or post-show. While you’re in Lakewood, be sure to explore the quaint city. Historic Lakewood is an idyllic, American town that tops many great living lists. Visit some of its independent shops or unique restaurants. Players on Madison has some of the best classic dining and pasta in Lakewood with a relaxed but modern atmosphere, and Deagan’s Kitchen and Bar is a newer hotspot, famous for unique twists on classics and a wide variety of beers. For upscale dining with a view of Lake Erie and downtown Cleveland in a pristine dining room, visit Pier W. Its fresh seafood, chops and cocktails will hit the spot. As you can see, there are a lot of wonderful things to do in and around Oberlin, Ohio. Here at Kendal at Oberlin, we’re proud to be part of a community with such a strong emphasis on learning, nature and the arts. Enjoy the outdoors at the Carlisle Reservation, part of the Lorain County Metroparks. Here you can enjoy hiking, horseback riding, and birdwatching. Dive into history with the Oberlin Heritage Center. Visit the historic Monroe House or enjoy a walking tour of the area’s best landmarks. There’s even a self-guided biking tour you can enjoy! Delight the senses at the Allen Memorial Art Museum. With astounding collections on display and fascinating exhibitions, this is one of the finest collegiate art museums in the country. Oberlin College is a well-known Oberlin institution. Kendal at Oberlin shares a special bond with the college. About 37% of Kendal at Oberlin residents are alumni or former faculty and staff, and those who aren’t alumni typically come because they love the college-town atmosphere. This special connection has translated into a host of enriching and educational opportunities for residents. Many people at Kendal at Oberlin have a keen interest in lifelong learning. They put that into practice by taking classes at the college, enjoying performances at the Conservatory of Music and working in collaboration with professors and students on energy and environmental initiatives. Students are regular volunteers at Kendal, and some even have the opportunity to live in a Kendal-owned property, exchanging volunteer time for room and board. Residents can travel via provided transportation to the Conservatory of Music to enjoy a number of the nearly 500 concerts on campus each year. The college now owns the century-old Apollo Theater and hosts everything from blockbusters to foreign and independent movies. It’s an easy distance from Kendal at Oberlin so during the warm summer months, residents can take a pleasant walk or bike to catch a show. Audit classes for free! With the permission of the professor or instructor, residents can sit in on a class at no cost. Not only is it a great lifelong learning benefit, but it also provides opportunities for intergenerational experience. With a variety of cultural venues to discover and good eats to indulge in, a short ride in any direction is sure to entice any Oberlin dweller’s penchant for something new. 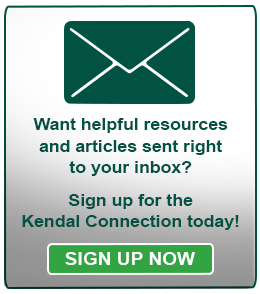 Whether you’re exploring the surrounding area or simply enjoying all the Kendal campus has to offer, you can always find something to do that’s enriching, educational, or simply fun. 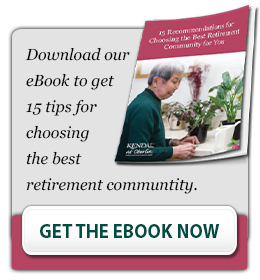 Kendal at Oberlin is a retirement community in Ohio, within an easy driving distance of Cleveland. Residents enjoy a full range of services, beginning with independent living cottages and apartments, and with the options of assisted living, memory support and skilled nursing if these become necessary. Our mission describes our goals: we strive to offer older people a vibrant, diverse and caring community. We support individual lifestyles by promoting independence, continuous learning, engagement in and service to the wider community, social and intergenerational relationships and excellent health care. If you would like to learn more about Kendal at Oberlin, contact us today or schedule a visit! 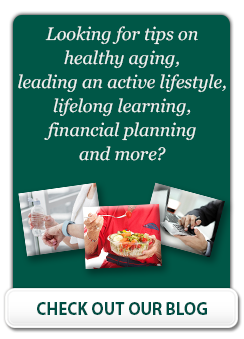 For helpful information on many topics of interest to older adults, check out our Senior Living Resources.